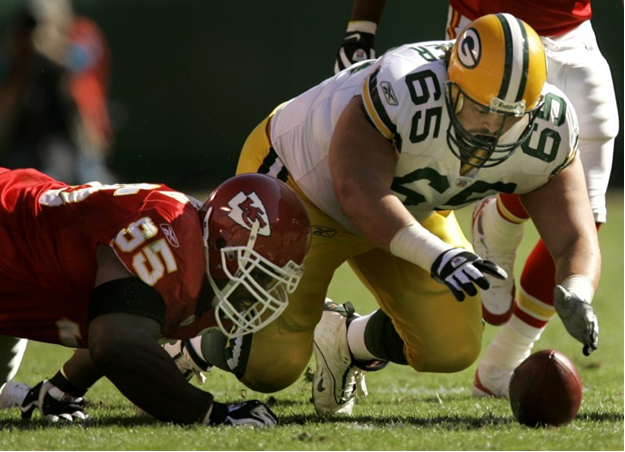 Green Bay offensive tackle Mark Tauscher (65) beats Chiefs defensive tackle Ron Edwards to a loose ball in a 2007 game at Kansas City. PHILADELPHIA — Like many of you, Mark Tauscher was camped out in front of a TV when the Green Bay Packers opened the season a year ago. Chances are, you got a lot more enjoyment out of the Packers’ 21-15 win over the Chicago Bears than Tauscher did. Watching the game at home with his wife and some friends was pure torture for Tauscher, a former University of Wisconsin athlete who was out of football while undergoing rehab for his injured knee. You can imagine the mixed emotions tugging at Tauscher. These were his teammates — some of whom are among his closest friends — winning a game against one of the team’s hated rivals. Naturally, he felt happy for them. But to watch the game play out on a big screen instead of being there manning his usual spot at right tackle? And not knowing when he’d get back on the field — or which team he’d be playing for if he did? Naturally, he felt sorry for himself. And his attempt to be a neutral observer? Well, that failed miserably. So here we are, 364 days later, and Tauscher is back where he belongs. When the Packers begin the 2010 season today against the Philadelphia Eagles at Lincoln Financial Field, Tauscher will be making his 129th career start at right tackle for a team many are predicting will end up in the Super Bowl. Tauscher tore the ACL in his left knee during a game against the Houston Texans late in the ’08 season. The timing couldn’t have worse for the Auburndale native, who went into the offseason as a free agent. In March of last year, Tauscher contacted the UW strength and conditioning staff and began rehab work under the watchful eye of assistant director Scott Hettenbach and athletic trainer Henry Perez-Guerra. Tauscher worked out five days a week at the Kohl Center. On the weekends, he did more work on his own. “It was difficult because he didn’t know if the Packers were going to bring him back, but he really never wavered,” Hettenbach said. “It was low-key — he didn’t want to make a big deal out of it. The phone eventually rang and it was indeed the Packers, who were in desperate need of some help before their franchise quarterback, Aaron Rodgers, ended up in a full body cast. Tauscher re-signed with Green Bay Oct. 12 and replaced overmatched right tackle Allen Barbre in the starting lineup less than four weeks later at Tampa Bay. To say Tauscher’s return saved the Packers’ season would be a huge stretch, but there are numbers to support the argument his presence provided a major boost to a struggling offensive line. The Packers were 6-2 in Tauscher’s eight starts. More importantly, after allowing 41 sacks in the first nine games of the season, Green Bay allowed 10 in the final seven. All of those seven games included Tauscher and left tackle Chad Clifton, who missed four games with an ankle injury early in the season, as the bookends of the offensive line. “There was certainly a benefit to having him back,” Packers offensive coordinator Joe Philbin said of the 6-foot-3, 320-pound Tauscher, a seventh-round draft pick in 1999. “I think he contributed, obviously. You’re playing a team sport, you’ve got 11 guys, you hope that as the season goes on your football team’s going to get better, you’re going to see improvement from everybody. Tauscher’s biggest impact might have come in the locker room. He’s popular among his teammates — especially Rodgers — and served as a calming influence upon his return, according to his teammates. Tauscher, who turned 33 in June, enters his 11th season with a new lease on his career. He signed a two-year contract worth more than $8 million in the offseason and, unlike most years when he dreads the start of training camp, actually looked forward to it this time around. It shows, according to Packers offensive line coach James Campen. “I’ve never had that type of surgery,” Campen said. “(Packers assistant offensive line coach Jerry) Fontenot has had it and others have had it, and they say the next year is better, much better. And certainly from a mental standpoint he feels much better. Certainly his movement and just look at him — look at his physique, I’m sure you guys can see that, too — he’s in shape and he looks good. The entire offensive line is confident. The starting group — Tauscher, Clifton, Wells and guards Daryn Colledge and Josh Sitton — got an abundance of reps during training camp and played well. Rodgers wasn’t sacked in the preseason — he attempted 53 passes — and led the No. 1 offense to seven touchdowns on 13 possessions. “I think the biggest thing is, there’s a lot of maturity in that room,” Campen said. “And the maturity has come from the younger guys growing up and obviously the guys in the middle recognizing that what transpired the first eight, nine games and seeing it shift over and performing pretty good the last half of the season. Tauscher doesn’t want to go back, either. He certainly feels much more comfortable at right tackle than he does in front of a TV.